Emeka Okafor was a Center for the UConn Huskies from 2001 – 2004. He was the Most Valuable Player of the 2004 National Collegiate Athletic Association Final Four when UConn won its second National Championship. In three years at UConn, Emeka enjoyed many honors, including National Defensive Player of the Year, Big East Player of the Year, and leading the nation in blocked shots during his junior year. I had the opportunity of talking with Emeka in October 2006, about his basketball accomplishments and memories. Colleges started recruiting Emeka; University of North Carolina, University of Arkansas, Vanderbilt University, Rice University and University of Connecticut were among them. “It was a pretty confusing process. You really don’t know what’s right, and you’re trying to make the right decision. It was a little bit stressful.” UConn had the qualities Emeka was looking for in a college; a basketball program that would get a lot of media attention, a good basketball coach, and good academics. Emeka didn’t remember the transition from high school to college as anything significant other than a lack of time. “I didn’t really have much time. You know, you come in, and have to work hard, and hopefully you’ll be successful.” While at UConn, Emeka averaged a double-double – 13.7 points per game, and 10.5 rebounds per game. 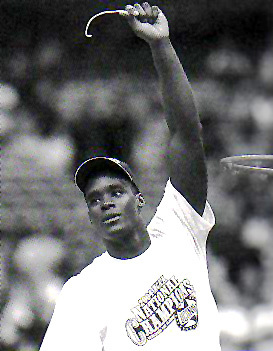 He holds the record for blocked shots averaging 4.3 per game, the most in UConn history. Emeka was also known as an elite student. He graduated with honors after three years with a 3.8 grade point average, and was named Academic All-American of the Year in 2004 for his work on and off the court. A few memorable games that Emeka recalled were the game against Duke in the semifinals of the NCAA Final Four. UConn won 79 – 78, and moved on to the Championship game against Georgia Tech University with UConn winning 82 – 73. The two most important moments while at UConn for Emeka was earning his Bachelors Degree in Finance, and receiving his NCAA championship ring. It was now time for Emeka to move on, and he declared himself eligible for the National Basketball Association draft.